Bernard Parker took South Africa closer to the semi-finals of the Confederations Cup by scoring both goals in a 2-0 win over New Zealand. 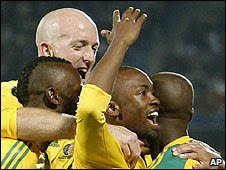 The hosts were under pressure after a poor 0-0 draw against Iraq, but dominated the match in Rustenburg. Both of Parker's goals were provided by Tsepo Masilela assists, but Everton's fit-again Steven Pienaar was also key. He started the move that led to the opener and was a creative force throughout the match. By scoring twice, Parker redeemed himself after being cast as a villain when inadvertently blocking Kagisho Dikgacoi's goal-bound header against Iraq on Sunday. While the permutations are plenty, South Africa, with four points, will guarantee qualification if they get a draw on Saturday with Spain. If they lose and the Iraqis beat New Zealand it will then come down to goal difference. South Africa: Khune, Gaxa, Masilela, Mokoena, Sibaya, Pienaar, Modise, Dikgacoi, Booth, Parker (Tshabalala 81), Fanteni (Mashego 61). Subs Not Used: Fernandez, Mdledle, Gould, Khumalo, Moon, Mhlongo, Davids, Van Heerden, Mphela, Baloyi. New Zealand: Moss, Lochhead, Vicelich, Elliott, Brown (Oughton 55), Smeltz, Killen (Wood 74), Bertos (James 66), Christie, Mulligan, Boyens. Subs Not Used: Paston, Scott, Sigmund, Old, Barron, Brockie, Bright, Smith, Bannatyne. Booked: Christie, Boyens, Smeltz, Vicelich. Ref: Benito Archundia Tellez (Mexico).